West Linn Vision Center is pleased to offer a wide range of optometric services, eye care products including eyeglasses, specialty eyewear, frames, and contact lenses. Our staff is happy to help however we can. Our mission is to enhance the quality of our patient’s lives with clear vision and optimal eye health. It shows in everything that we do. From your first contact with us to your appointment and your follow-up, we aim to make your eye care experience great. This is what drives us to provide you with the best care year after year! Dr. Brad Smith received his Bachelor of Science degree in Visual Science and his Doctor of Optometry from Pacific University. He received the American Academy of Optometry’s Julius F. Neumeller Award in Optics and the Beta Sigma Kappa Research Design Award in 1987, and the Oregon Optometric Physicians Association’s Young Optometrist of the Year in 1997. Dr. Smith joined our practice in 1987. 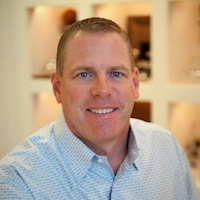 Dr. Smith enjoys golfing, flying, barefoot water-skiing, traveling, and spending time with his family. Dr. Keely Hoban was born and raised in Montana. 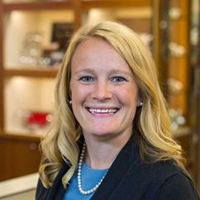 Dr. Hoban earned her Bachelor of Arts degree in Chemistry in 2007 from College of Saint Benedict (Saint Joseph, MN), and achieved her Doctor of Optometry degree with distinction from Pacific University in 2011. She spent 2011 and some of 2012 at the Portland VA Medical Center doing a residency specializing in primary care with emphasis in ocular disease and low vision. Dr. Hoban and her family currently reside in Portland Oregon, where they enjoy golfing, hiking, playing tennis and spending time with family and friends. Dr. Bee enjoys skiing, hiking the Pacific Northwest, playing tennis, and spending time with family and friends. time with her friends and family. 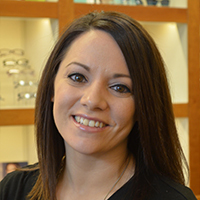 Katie began working at Tigard Vision Center in the beginning of 2007 as our Office Manager. Prior to managing the office, she practiced law in the State of Washington for 15 years. 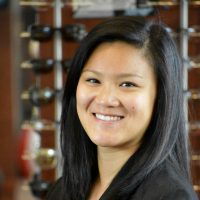 Since coming to work in the field of Optometry, Katie has developed a new passion for eye health, eye wear, and superior patient care. She continues to be an active member of the Washington State Bar and the Oregon State Bar. Her hobbies include volunteering at her son’s school, golfing, snow skiing and spending time with family and friends. 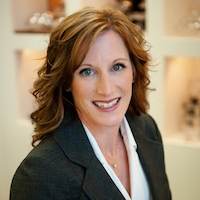 Having graduated from Northwest Nazarene University with a bachelor’s degree in Social Work, Kristen started working in the healthcare industry within the Durable Medical Equipment sector while living in Meridian, Idaho. 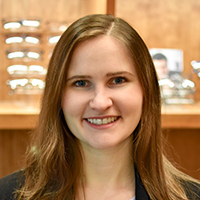 She moved to Portland in 2015 and began working at Tigard Vision Center during the Spring of 2018. She enjoys traveling with her husband, Kyle, and cozying up to their dogs, Lola and Conan, with a good movie. Kristen is also a U-Jam Fitness Instructor and she loves to stay active.